Preferred in many commercial establishments as a durable and low maintenance flooring option, vinyl is mainly used because it reduces upkeep costs and is highly water-resistant. Once you have installed a vinyl flooring within your office or business, you won’t have to think about a replacement until after several years. Besides that, the material is available in a vast range of style, texture and colour options to choose from, including those resembling stone, ceramic and hardwood. However, since the premises of a commercial establishment handle a lot of traffic almost everyday, using vinyl as a vinyl flooring material can necessitate some special care in order to have better durability rather than becoming dull over time. The primary contaminants that can cause damage to vinyl floors include small particles of debris, sand and dirt, which are usually tracked by the wind or shoes of people walking across the flooring. As these small bits get dragged, they behave like sandpaper grits and result in minute scratches. Among the best ways to prevent damage to a vinyl floor is preventing the tiny particles from remaining on the surface of the material for too long. Regular sweeping, mopping and vacuuming would not only remove those detrimental bits, but also make the vinyl look more appealing by removing greases and oils. Placing mats near the exterior doorways and entrances can aid significantly as well, since they would trap majority of the debris and keep it from getting inside. 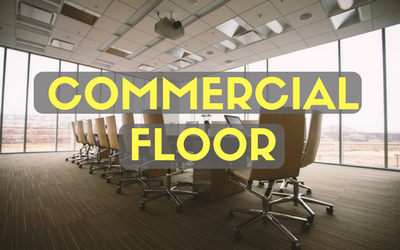 Also, there are quality commercial floor sealers available that can be applied on vinyl flooring to form a stain-resistant layer over the surface and thus, ensure protection. But it is important to buy the right type of finishing agent or sealant - it must be something formulated for working on the kind of vinyl it would be applied on. Small dents and scratches must be repaired with the help of a quality liquid seam filler. If you wish for the vinyl floors of your commercial place to receive the right care, then get in touch with our expert cleaning team at Pharo. We would help to prolong the life of your investment and provide a new-like shine to it, without using any kind of toxic finishing agents. Moreover, our cleaning service is done periodically, in order to ensure maximum shine to your floor. Was this post useful to you? If yes, then let us know how in the comment section below.